The late, great Warren Publishing issued several classic, long-running comics/geek-related periodicals — most notably CREEPY, EERIE, VAMPIRELLA and the venerable FAMOUS MONSTERS OF FILMLAND — but they also put a number of lesser-known magazines and one-shots, many of which were of middling-to-dubious quality at best. 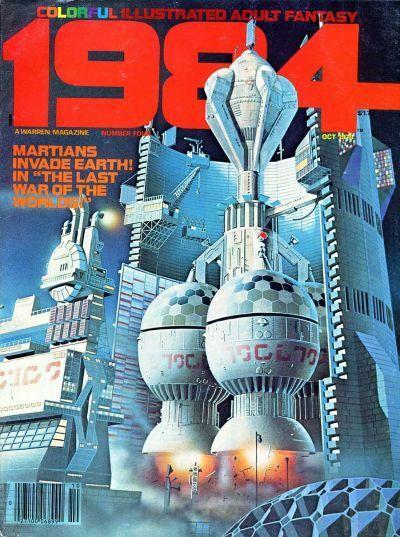 One such of those was 1984 (June 1978-December 1979, then changing its name to 1994 and running from February 1980-February 1983, for a total run of twenty-nine issues), a more "adult" magazine than its contemporaries in its embarrassing attempt to ape the then-new HEAVY METAL, only considerably less sexually explicit. 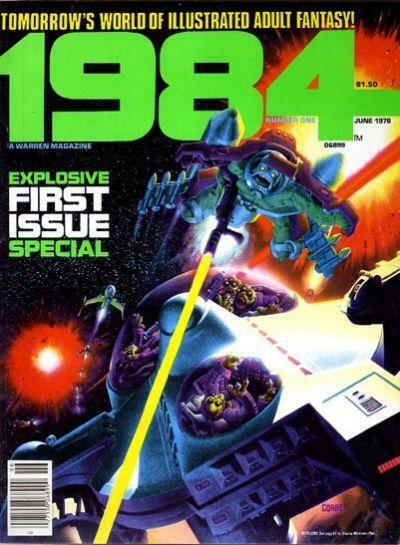 Overall, 1984 featured about the standard level of artwork that allowed Warren to thrive for nearly two decades of well-deserved critical acclaim, but even work by the likes of José Ortiz, Richard Corben (perhaps my very favorite cartoonist of all time), Alex Niño and Esteban Maroto could not mask the fact that most of the scripts were embarrassingly juvenile crap that at times seemed to have been scribed by a not-very-bright adolescent boy stuck in after-school detention. In other words, a gilded turd is still nonetheless a turd. 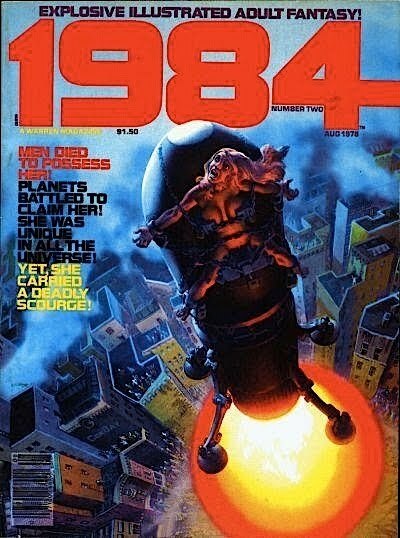 1984 #2 (August 1978), the first issue I ever read. The cover perfectly sums up the magazine's level of wit and "adult" sophistication. But if one were willing to sift through the considerable dross found in 1984's pages, one might chance upon the occasional gem. For my money, the best thing to ever grace the magazine was a four-installment series called REX HAVOC AND THE ASSKICKERS OF THE FANTASTIC, written by Jim Stenstrum and drawn by Abel Laxamana, and it was basically a very funny precursor to the likes of the Ghostbusters, only with more balls-out absurdity and silliness (and cussing, since this was an "adult" magazine, let us not forget). Fun on a bun, especially for all of us "monster kids," the Rex Havoc stories gained a very minor cult reputation and three of the four stories were compiled in WARREN PRESENTS #14 (November 1981) as REX HAVOC: RAIDERS OF THE FANTASTIC, a pointless, feeble and totally unrelated attempt to cash in on the then-new RAIDERS OF THE THE LOST ARK. One of the most embarrassing cash-in attempts I've ever seen. Anyway, the individual issues of 1984 and the ludicrous RAIDERS special can be a tad pricey on the collector's market, I've dug out the complete run of the series from the depths of the Vault and will be running them over the next few days, strictly for the enjoyment of those who have not previously had the pleasure of reading them. Oh, and by way of a disclaimer, all of this material is the property of Warren Publications or whoever may hold the rights at the moment. And with that, here's our first installment, from 1984 #4 (October 1978). Double-click on the images to embiggen; once you do that there should also be a magnifying tool to facilitate it even further. 1984 #4 (October 1978). 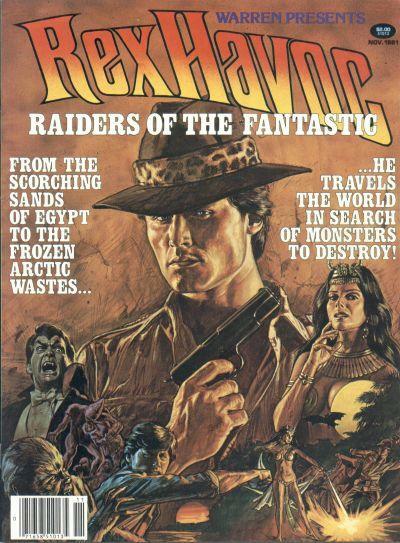 While other series and stories from this magazine occasionally were showcased on the cover, REX HAVOC never was. The publishers just didn't know what they had. Looks like a bitchin' comic series. What the hell ever happened to that Stenstrum guy anyway? I hear he bought Ted Kaczynski's old cabin and is writing a manifesto in comic book form. Jim, as you can see, I loved this series. Thank you for all the fun, and make sure to come back on Thursday for what I have to say about your handling of my beloved Japanese giant monster genre in "Humongous." EXPLODEY THE PUP IN REN HOEK'S "I LIKE PINK"
WAY TO TAKE HOME THAT LITTLE NEKKID DUDE, NAT! GIVING NEW MEANING TO "THE MAN OF STEEL"
A GENERAL UPDATE or "Moan, Moan, Moan"